Marios Frixou, right, and Fanos Eleftheriades smile during their wedding ceremony at the Nicosia District Office in the capital of the Mediterranean island of Cyprus, Friday, March 4, 2016. 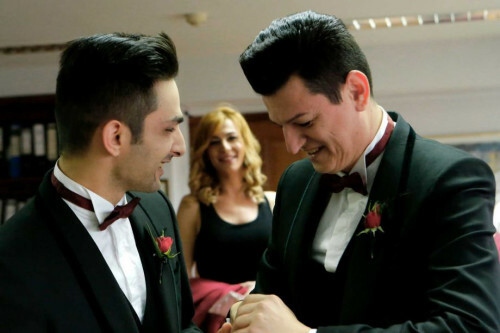 Cyprus’ first gay couple to go public with their wedding on this east Mediterranean island nation say they’ve done so to give courage to other gay couples to shed fears of derision and shame. LARNACA, Cyprus (AP) — The newlyweds wanted to go all-out with their wedding celebrations. All the trappings of a traditional Cypriot wedding were on display; the huge line of well-wishers with cash-filled envelopes in hand, a band playing the latest Greek pop hits and the mandatory roasted pork. Marios Frixou and Fanos Eleftheriades said they wanted it that way, a public declaration of their commitment to each other. Their hope is to offer other gay couples on the small east Mediterranean island nation the courage to be open about their love for each other. Their union is the first public gay wedding in Cyprus, which has ranked low on an index of LGBT rights. It follows last month’s first gay wedding but that was a low-key event involving an anonymous couple. Late last year, lawmakers paved the way for the weddings by passing a civil union law that in effect recognizes gay marriage. It was a big step forward for gay rights in Cyprus, which only decriminalized homosexuality 18 years ago. The wedding ceremony itself took just minutes — a simple exchange of vows in front of the Nicosia District Officer with the couple’s two best women and a few friends on hand. The reception was not so modest and hundreds of people showed up to wish the happy couple all the best. Keeping with Cypriot tradition, Frixou’s mother greeted the couple by handing both newlyweds a gold coin, old family heirlooms which they hung around their necks. The couple danced to a violin rendition of the traditional wedding song. Frixou — a 36-year-old former literature tutor who hails from the small village of Xylophagou in the island’s southeast — isn’t shy about being in the public eye. The garrulous prison guard has racked up several talk show appearances, authored five novels and is actively involved in charity work. He says some of the proceeds from the reception will go toward helping sick kids. Fanos, 26, works at an upscale store of a famous Italian clothier. “The village doesn’t see my as ‘Marios the gay guy’ because I was up front about who I am from a very early age,” says Frixou. The wedding caps a seven-year relationship that began when the two met through a colleague of Frixou’s.